For about four weeks, starting in mid June, Germander flowers paint the borders of our garden. The rich mauve flowers mix elegantly with the dark green, waxy leaves and set off other pinks in the garden like Marshall's Memory Oregano, Tricolor Sage and Pink Gaura. 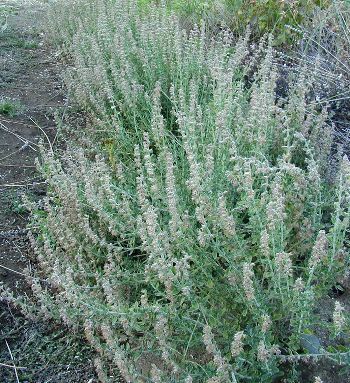 Germander, an evergreen sub shrub (or suffrutex) of the Teucrium genus, which also includes, Cat Thyme, and the ground cover Fruity Teucrium, makes a great hedge. 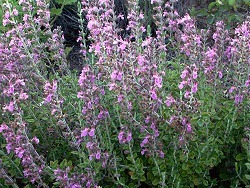 A sturdy little plant, Germander is easy to grow almost everywhere in the US. And, most of the time it looks great; but you do need to decide if you want to use it in a carefree way where the flowers are enjoyed or in a more formal way where it is pruned often to maintain a tight hedge. Like most flowering perennials, the colorless spent flowers left behind can be unsightly as the photo on the left shows. 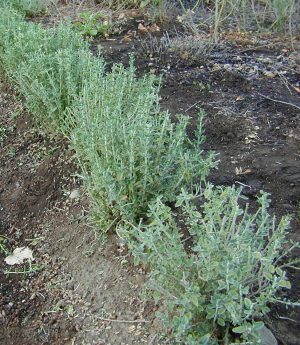 Pruning right after bloom will help to renew the Germander faster. We prune in several ways. First, we grab fists full and bring them up to the height we want to cut at. To give the plant some growing room, this height is usually a few inches below where we want the hedge to top out at. This measurement does not include the flowers. Flowers are difficult to speculate on because they can splay out in all directions. And, since they are airy instead of dense like the shrub itself, they mix with, instead of hide, the plants behind them. After we perform this first pony tail cut on most of the plant, we look for pieces that are jutting out on the ground. These we cut all the way back to the main clump. That may mean they are completely removed or just pruned to blend in with the rest of the mound or wall we are forming. Finally, we remove several old woody pieces that make the newly pruned plants a little uglier than they need to be. These usually have some new growth on the tips but are fairly barren the rest of the way down the stalk. The whole process takes maybe four or five minutes per plant and removes about half of what was there to start with. If you want to be really precise, you can go back with grass shears and prune out any stems or leaves not towing the line. In about three weeks the hedge will fill in nicely and stay that way until spring when the flowers will once again take off with wild abandon. Because it does take well to shearing, Germander is a favorite for knot gardens and parterres in castle yards and showcase gardens throughout the world. In these very formal gardens the plants are not allowed to flower. They are planted more closely together (about every 6 inches) and sheared repeatedly throughout the growing season, which causes the hedge to stay neat and tidy. This wall garden depicts the perfect way to manage the sometimes unruly looking culinary herbs and still have some formal decorum. This traditional culinary garden includes 1 Lemon Thyme, 1 English Thyme, 1 English Lavender, 1 Garden Sage, 3 Chives, 3 Italian Parsley, 1 Bronze Fennel, 1 Greek Oregano, and 2 Winter Savory surrounded by 22 Germander. The best part about this garden is its size and versatility. If you don't want these culinary herbs, choose any that are hardy in your area. You could even fill it with flowering or fragrant plants. No matter what you put in the middle the edging keeps it tidily tied together. 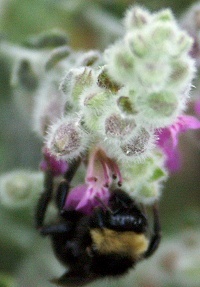 If you do use Germander in mass, you will be rewarded with the hum of bumblebees as you work in the garden. One of the greatest sounds for an organic gardener is that of happy bees. It lets us know that the yard is safe for the bees and the beneficial insects that help keep the use of pesticides at bay. A truly balanced garden never needs to be sprayed or doused with chemicals that kill all insects. After all if we don't allow a few aphids to gather, we will never enjoy the ladybugs. This plant is often available in plug trays. These trays hold 128 of all the same plant. They are a great low cost way to fill a lot of space. Each cell is 3/4 of inch by an inch. Check here to see if Germander Plug Trays are available.